Our roots run deep in Texas (Everman is the name of a little town in our home state) and Hong Kong (yes, the city near China) - strange bedfellows, we know. Brad Miles, our lead singer, grew up in Texas, went to college in Texas and fronted a band that toured Texas extensively for several years. Marcus Yoars, our guitarist, grew up in Hong Kong as a missionary kid and, well, owned a Dallas Cowboys shirt as a kid, if that counts. Following college, Brad and Marcus moved to Nashville for decidedly different reasons but soon met on a common ground: music. Our friendship and musical partnership is as Abbott and Costello as they come: Brad is the voice - out front, passionate, vibrant, constantly in motion - the kind of guy who shouldn't be allowed to drink coffee. Marcus is quiet, his influence more subtle - he's the rock. Truly, we need each other. We're a musical and personal brotherhood. 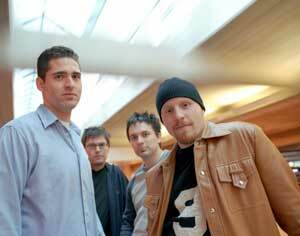 After a few years in Nashville, we added bass player Glen Kimberlin and drummer Chris Brush (both fellow Texans) and signed a record deal with Gotee founder and producer Todd Collins (DC Talk, Audio Adrenaline, Out of Eden) on his new label, Beatmart Records. We hate to use a cliche to describe our vision, but the truth is, Everman is on a mission. We feel like God has given us songs - lots of songs - so we can interact and relate to people. For us, writing songs and spending time in the studio is a means to an end. This journey isn't about the singles, the chart-busters or the press time. It's about people. Hearts. Lives. Don't get us wrong - we're proud of our music and believe it speaks for itself. But at the same time, we'd rather use the music as an instrument to hear you speak. Here's what we've figured out after years of mistakes: We spend about 10 hours on stage each week. We love that time and want to be the best we can be. But to put too much focus on that time would be to overlook our real calling. We've got 158 more hours a week to do the "stuff" that really matters - building relationships that last through the come-and-go reviews and the not-so-tight concerts. We've seen God at work on stage, but we've seen Him more in the private prayer of a high schooler or through our initial contact with a youth minister when we arrive at a church or in a late-night conversation with a tired hotel clerk. That's what our music is about. We sing and write about the highs and the lows, but that's not where we spend most of our time. Our music finds us dealing with the a wide variety of topics seen in everyday life: celebrating transforming grace ("Changing Me"); struggling with rejection ("Believe"); hurting through divorce from a child's perspective ("Still Waiting"); anticipating the birth of a daughter ("December"); praising God for who He is ("You Are"); and dealing with grief in the senseless death of a dear friend ("I Will Remember"). Most of it is stuff we all deal with on a day-to-day basis, from the everyday waiting to hear from God to the mountaintop emotions of life-changing worship to the telephone call that stops our world. These are the places we all live. More than anything, our music is reflective of those places. We hope that listening to our record or seeing us play is like watching us pull apart our rib cages and exposing what's inside. And we hope you see yourself. We wish we could compare our sound to something specific. It's acoustic-based, it's passionate, it's heartfelt, and it's more pop than rock 'n' roll. At the end of the day, it's what God has placed in our hearts. We hope we've been faithful to it. We hope you like it. And we pray it speaks to where you are.